Frying or sautéeing is a favorite way to cook and eat smoked herring in the Caribbean. Smoked herring in the Caribbean is salt-cured and smoked to preserve it. It is similar to salt fish which is made with cod. 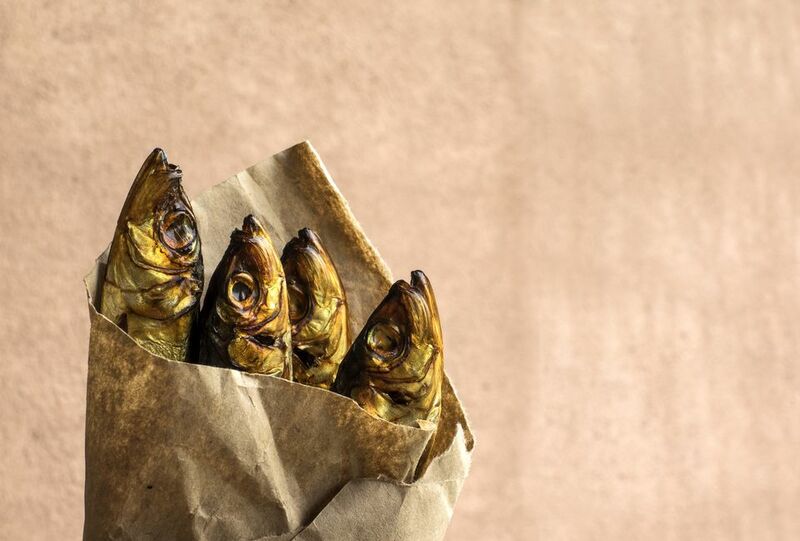 One of the main differences when cooking these two treatments of fish is that smoked herring doesn't require an overnight soak to get rid of the saltiness. Usually, a 5- to 10-minutes boil does the trick. When smoked herring is prepared this way, it can be eaten with rice, bread, bakes, roti or dumplings. It makes a great lunch or dinner dish. Add the smoked herring fillets to a saucepan with water to cover. Bring to a boil. Boil for 5 minutes and drain thoroughly. Set aside. When cool enough to handle, chop fish into tiny pieces and set aside. Add oil to a skillet and heat. Toss in onions and sauté until translucent. Add tomatoes, hot pepper, garlic and thyme and continue to sauté for 1 minute. Add boiled and drained fish and toss to mix, cooking for 5 minutes. Stir in lemon juice and green onions and remove from heat.